During my second year at Northeastern, I befriended some engineers. Something I noticed quickly was that in addition to co-ops and clubs, the majority of them were trying to get involved in the same thing: research. But as a business student, I hadn’t thought much of participating in research – it seemed like something only for hard science majors. But the more my friends talked about projects they were hoping to work on, the more I kept wondering, why shouldn’t I get involved? Academic research presents an amazing opportunity for students. While not as frequently advertised for students outside the sciences, it is available to students of all types of majors. My experience thus far has been absolutely incredible, and below are my top six reasons why business students should get involved in academic research. First and foremost, involving yourself in research when you aren’t in a hard science program is unexpected. There are many opportunities available that schools don’t seem to be as vocal about. When I tell people I’m involved in research, there is usually a moment of hesitation, as though they are debating with themselves as to whether or not I’m actually a business major, or if they are remembering my major incorrectly. But research is very relevant to business, and marketing in particular. Marketing research is vital to companies. When a new product is being launched, a company doesn’t just hopes for the best when promoting it. Rather, they do market research, surveying and running focus groups, getting customers’ opinions, which can help them determine better ways to market their product. Involving yourself in research opens up an entirely new realm of possibilities, ones that can help you grow your own skill set, as well as introduce you to new aspects of business not typically discussed in classes. 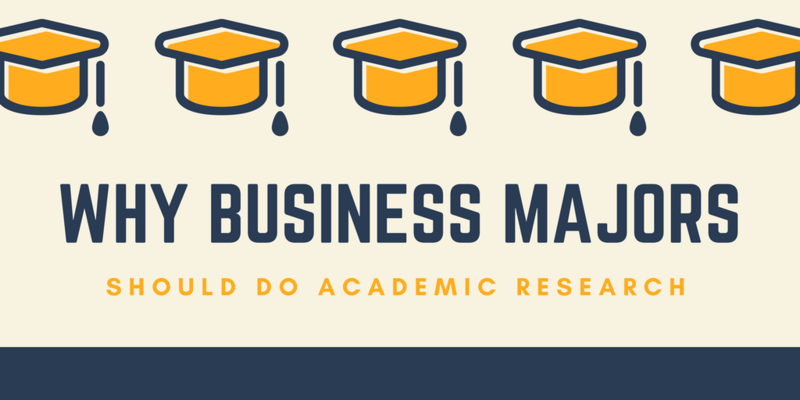 Although unexpected for a business major, academic research is a fantastic way to get involved in your major outside of the classroom. Another benefit of research is that there is so much more to it than I initially expected. When I started, I thought that my team would be able to have the first draft of our research paper by the end of the first semester. Research is intense. There are a lot of moving parts, with much going into a successful project I hadn’t even the foggiest idea about. When I took a class on marketing research we completed a research project. For that, we created a survey, ran a small focus group, and read a couple of articles. We took the data we received from the survey and made conclusions from it. While it wasn’t easy, it took only a couple of months to complete. I thought academic research would be the same. But what I did in class only scratched to surface. For the project I’m currently working on, I have researched different concepts, read papers on different research techniques, codified data from blogs, watched television shows related to our topic to take notes on trends, developed concept maps to more easily identify overarching themes, and have just finished finalizing interview questions. Moving forward I am going to conducts interviews and focus groups (after gaining certification from the National Institutes of Health Office of Extramural Research), create surveys, and continue to codify resources, turning qualitative sources into quantitative data. My team will then use this information and previous research to develop a thesis, which we will use to guide the first draft of our paper, with multiple rounds of edits to follow. Once edits are finished the paper will need to be looked over by a review board before it can even be considered for publication. Definitely not something that takes two months. Getting involved in research has shown me how complex it can be. I appreciate the hard work that goes into research so much more now being on the other side and respect the individuals who dedicate their life to discovering new theories, concepts, and connections that make it easier for people to be understood. Academic research also inspires a different way of thinking. In a typical learning environment, you listen to someone speak, write out notes, study your notes, and take a test on them. While hopefully there is a deeper understanding, at the base the learning is centered around rote memorization. The thinking used to complete academic research is much different. Rather than being told something, you are the one discovering what is important. Ultimately you will become the one teaching others about your research findings. Research requires questioning everything. What is it you are interested in? Are you looking for connections between bigger themes? What else works within that theme? What doesn’t work? Are you not getting the results you expected? If not, what does that mean? The more you discover, the more questions you ask. When you start to gather answers to your questions, then you can tie them into bigger ideas, explore those ideas, look for more connections, take notes, go back to the drawing board, and start asking questions all over again. From there, you can start to figure out which direction to take your research in. While I had some experience in this type of thinking from working on different case studies with the marketing association I’m involved in at Northeastern, it wasn’t to the extent academic research requires. The different type of thinking required to research involves questioning everything and formalizing concepts and ideas based on the answers, a type of thinking typical class work lacks. Research forces you to think about problems differently and look at the world in a more inquisitive way. This is a great way to practice looking at situations from different angles, and something that greatly adds to the typical school experience. Something else I find exciting about academic research is that I have the opportunity to become an expert about topics I wouldn’t have otherwise. For my current research project, I am assisting on a study focused on minimalism. Minimalism, to start, is the idea of simplicity in life. Seen in design, art, music, fashion, life, and more, minimalism has begun a resurgence in popularity as people have begun shying away from the increasing levels of consumerism. Minimalism has so many more interesting facets however. For the research I’m assisting on, we are focusing mostly on people who own tiny homes (homes less than 400 square feet) or capsule wardrobes (closets less than approximately 40 pieces). Neither of these had I ever looked into before, beyond reading the occasional article about HGTV’s tiny house themed shows or fashion magazines talking about downsizing your closet. But research in these two topics goes beyond definitions. We are researching the motivations that push people to engage with these trends, challenges people have adopting this new lifestyle, benefits people receive from starting, the communities behind them, and much more. We are able to discover how people who join these movements feel about minimalism, and what they are able to show about the concept of minimalism as a whole. And that’s just what we’ve been seeing so far. I am also learning about different types of research, and how someone goes about selecting which style is best for them. I have the most experience with grounded theory, and have read multiple papers explaining the benefits and seeing how other studies have used this theory to accomplish their goals. Academic research pushes me to explore new ideas. While marketing themes like consumer behavior are seen throughout my research, I am also learning about trends sweeping the nation I was completely ignorant of, and learning about movements I can take some guidance from. Being a research assistant means that you are doing a job relevant to your interests. I am interested in marketing, and through research, I am able to work in my field while being a full-time student. Research provides so many career and academic benefits, and the fact that you can (sometimes!) get paid for it is even better. Especially if you have work study or financial needs that require a job. Being an academic research assistant is also a great resume builder. Having a job in general while in school is a great addition to a resume, but the type of work academic research provides makes it that much better. Depending on the type of research and the duration of the job, there is a high probability that you could be involved in the process of a research paper being presented to an academic journal. My work involves me assisting with the entire process from beginning data gathering to eventually helping to write a paper that will be submitted to a journal. This will be something I can include on my resume, especially if there is the possibility of co-authorship. This is a phenomenal opportunity. How many college students can say that something they worked on was published in a nationally recognized academic journal? It’s a great addition to any resume, not to mention a great experience to have. Probably the best part of being involved in research is the fantastic relationship you get to form with your coworkers. The researcher I work for, Dr. Daniele Mathras, is absolutely brilliant, and before I got involved in research I probably wouldn’t have ever had the chance to get to know her. The university I attend, Northeastern University, is a research university, which means that research is a core part of the job description for professors. Therefore most professors employed by the university are working on projects related to their interests. I was unaware how many different opportunities there were available. My consumer behavior professor researches how ‘moral emotions’ like guilt and shame influence buying decisions, my marketing management professor researches the impact of social media and digital technologies on advertising effectiveness, and my boss focuses on the role of cultural belief systems in shaping consumer behavior and well-being. This is absolutely fascinating to me. Before I got involved in my own research, I probably wouldn’t have thought to ask about the research projects they were running, mostly because I wasn’t aware of the many directions marketing research could take. Working with Dr. Mathras and learning more from other professors has taught me so much, and has expanded my relationships with them. I appreciate the work they do so much more, and how difficult yet rewarding it is to discover something entirely new. The professors at Northeastern are amazing, exciting, and interesting people. Getting to work with Dr. Mathras gives me the opportunity to learn so much from a person who is not only my boss, but someone I would consider a mentor and friend. And if that isn’t reason enough to get involved in research, I don’t know what is. This entry was posted in Business and tagged academic-research, marketing-research, minimalism, research. Bookmark the permalink.